The incredible force of unleashed moving water is one of the most awesome factors in our lives. Even those who understand it, view it in awe. Moving water seems to beckon to the human race, come play with me. The brave at heart yet often naive in skill, are all to quick to respond to her call of promised adventure. White water and flood waters move so fast with such an incredible force, that even well trained and capable adventurers need to constantly think, move quickly and more powerfully, or they too may find that their adventure may not turn out as planned, but rather, in disastrous fashion. When the lure of excitement and adventure falls short and disaster occurs, public safety response teams around the world are forced to act. Trained and untrained public safety teams are suddenly requested, and often even required to aid, to hopefully rescue the misbegotten adventurers, while keeping themselves out of harms way at the same time. Where do you even begin with moving water rescue. Words like force, power and energy all become part of rescuers instant vocabulary. What do these terms mean, how do they relate to the moment in the procedure and planing of the rescue? Before I can begin teaching a team how to set up and plan for a moving water rescue, they need to understand what moving water is and how it relates to the overall rescue and the victim. Only then can they even begin to understand where our catch points are going to be and how far apart they need to be. The nautical mile is 6000 ft versus 5280 ft on land. 6000 ft dived by 60 seconds (one minute) equals 100, that is 100 feet per minute, hence 100 ft per minute equals 1 knot. Waters equivalent to a mile per hour. A free moving body immersed in moving water will travel in equal proportion to the speed of the water. In other words, if the water is moving 4 knots, 400 foot per minute, the body is moving 400 feet per minute. Until the victim submerges or becomes trapped / caught in a strainer, he will continue to travel in direct proportion to the speed of the water. Waters speed can and will change throughout out its travels, you may need to re-adjust the victims movement based on these differences if they are dramatic. Keep in mind in the beginning stages, you are mostly interested in the fastest or shortest time the victim will arrive at your proposed rescue point. First how do we begin to figure out how fast the, surface water is moving. 1. We can use a tennis ball, throw it in the water and walk along the shore 50 ft to 100 ft. and look at your watch, this is basic time over distance. Basically any thing that floats will due.2. Place a tennis ball inside a Styrofoam coffee cup, now you can adjust for the wind as well. Wind and moving water both effect free moving objects. 3. Where shore banks are not convenient, and bridges or over hangs are your only option. Take an old fishing reel or anything that you can control the free wheeling spool, push a piece of fishing line threw the tennis ball, knot it so it can not easily come off. Now tie a knot in the line every five feet, with a double knot at the twenty five foot point, a triple knot at fifty foot and so on as needed. Usually one hundred to one hundred and twenty five feet of line is plenty, for low bridges. 4. Lower the tennis ball to the water, count your mark as the ball touches the water, 10 ft., fifteen ft. etc. now let the current take the ball. Allow the line to gently slide through your fingers. Count the knots and watch your watch. Thirty or sixty seconds later what do you have. Speed divided by time traveled equals distance. 100 ft (30.5m) per minute = 1 knot. As long as your test unit or victim travels 100 ft (30.5 m) you can divided 60 sec. as a constant, by the travel time, the sum will equal knots. The difficulty is that very often there is not enough room to physically or visually measure a complete 100 ft distance. 50 ft (15 m) in 30 sec. equals 1 knot as well, time and distance divided by 2, hence 30 sec. becomes your constant, if the unit or victim travel 50 ft (16 m). 30 sec. divided by travel time again equals knots. 1. Since the nautical mile is world recognized we will need to work in feet or meters, based on the fact that 1 knot equals 100 ft (30.5 m) per minute.2. 6000 ft equals 1 nautical mile or 1.85 kilometers. Quick scale; Speed divided by time traveled equals distance. Note; 100 ft (30.5m) scale, divide 60 sec. constant, by travel time. 50 ft scale, divide 30 sec. constant, by travel time. 6000 ft = nautical mile equals 1.2 differential, 40 knots multiplied by 1.2 = 48 miles per hour. These are phenomenal speeds the victim is basically traveling at all most three quarters of a mile per minute. This rescue needs to be planned as if they were traveling one mile a minute. We round up since we are trying to plan where we will need to set up our rescue operation. You may only get the one rescue attempt, if you miss them that is one thing, but if you are not ready due to poor planning, that is another. It is better to be ready ahead of time. What does being ready mean? 1. Where are your best access points, how do they relate to where the victim is now and how fast he is traveling.2. Where are your catch points and standing strainers, hazards that could change the whole process of the rescue in split seconds, are you posting look outs at those points to assure the victim has passed them and is still moving? 3. During training sessions have you timed yourselves as to your best times, worst times and normal times in setting up for a moving water rescue. What is your typical moving water rescue set up time when you have not practiced in a few weeks. That’s probably going to be your norm in a real rescue situation. These times all need to be taken into consideration, where is the victim now versus his anticipated location when you are ready to execute your rescue. How fast is he traveling and where is he going to be in eight minutes, twelve minutes or fifteen minutes. 4. Your set up time plus travel time need to be included in the equation in order to properly decide where you are going to set up your rescue operations well as were secondary rescue operations will be placed. In rescue response today we speak of operational personnel as being in three basic levels Awareness , Operations and Technician. All three levels should have a basic understanding of the speed of water, how the victim is traveling. Basic distance over time. Any level could track the victim with a vehicle, when and where the shore line allows for visual access. Even when visual contact is intermittent you can obtain a reasonable idea of the victims moving speed. How fast is he / she moving in comparison to your driving speed? This information needs to be than transferred to the in route rescue team, Operations and Technicians in order for them to calculate how far down stream should they think about setting up the first rescue operation. If the victim is moving at 4 miles per hour 1.2 times 4 = 4.8 knots approximately 500 feet per minute. 1.2 equals the difference between 1 mile per hour and a knot. rescue set up areas? The key is how long do you believe it will take you to get there. Three, five , ten minutes what ever it is, it needs to be in the plan, ten minutes the victim will have traveled another mile. With a ten minute set up time you now need to be two miles down stream to even begin to set up. Where does the second rescue operation begin to set up? If they are right behind you, then a few hundred feet down stream is great, if the area is acceptable. What if they are three to five minutes behind you, in three minutes the victim will have traveled an other quarter of a mile, their travel time plus set up must be in the calculation. • Have you practiced moving water rescues with your mutual aid, are you familiar with each others techniques and set up times?• Have you mapped out your best rescue areas, as well as not first choice but capable areas. • Are there spotters in order to maintain frequent visual contact with the victim and verbal contact with command? • Are the spotters equipped and capable of using throw bags in case a throw rescue suddenly presents its self? • Do they understand that even though a throw bag may not be capable of completing a total rescue it could assets in diverting the victim from a deadly strainer area? In areas where water is moving at high speeds 10 to 15 knots, we may want to add the concept of slowing the victim down in order to aid in a full and successful rescue. This would mean that distances between rescue operations would be closer, and communications would have to work better. Think about how difficult it is to stop anything at 15 to 20 miles per hour, and the impact on the item when you do. Weather you live in an area where floods, white water, or moving water rescues are a typical occurrence or not there is no replacement for skill , knowledge, proper training and preparation. 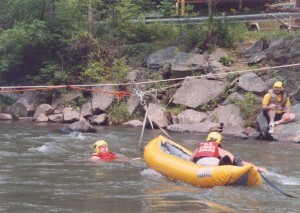 The actual rescue techniques will often change do to your local conditions, but the concepts of moving water are always the same.